Wernigerode train station is easily accessible from the transport hubs of Hanover to the NW or Halle to the southeast using regional trains and the Harzexpress train line. From the A7 motorway or the A395 motorway, take the B6 toward Wernigerode. From this road, turn onto L82 and follow signs to the city center. Right there iat the pedestrian zone you will find the National Park Management, which provides you with all necessary informations about the park itself. Extending over two regions of Germany, Sachsen-Anhalt and Niedersachsen, Harz National Park is filled with beautiful forestland and is one of the largest national parks in Germany. Take one of the well marked hiking trails through the park's vast forests and keep your eyes open for wildlife along the way. Deer, wild boar, bats, woodpeckers, and even lynx find refuge here. This park also offers excellent services for visitors with 5 park visitor centres and about 40 rangers eager to share their knowledge of the land with you. One of the park's highlights is definitely taking a ride on the Brockenbahn, or Brocken Railway, to the highest mountain in the region, the Brocken. This peak is characterised by its granite make-up, very little vegetation and lots of fog, and it offers a unique view from up here of the forests, canyons, and valleys that take over the landscape. The railway was built in 1898 and still chugs up the hill powered by steam. If you are looking for a more active alternative, you can hike up to the summit as well along a well-marked hiking trail, which will take about 5-6 hours roundtrip. If you aren't lucky enough to spot a lynx in the wild, check out the Lynx Enclosure located within the park. Between April and November, you can come and see this naturally shy animal. You can even watch lynx feedings on certain days of the week. Looking over the town of Wernigerode in the Harz mountains is Wernigerode Castle. With foundations dating back to the 12th century, the current castle dates to the late 19th century and resembles the style of the famous Neuschwanstein Castle in Bavaria. Peacefully located in the health resort of Ilsenburg at the foot of the Brocken Mountain, this 5-star country-style hotel boasts award-winning gourmet cuisine and a large spa area with pool, hot tub and sauna. This hotel in Saxony-Anhalt has received Germany's eco-friendly Bio label and offers spacious rooms and a wellness area. 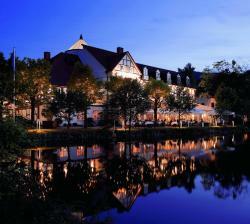 It lies at the foot of Hohen Brocken Mountain, a 10-minute walk from the town centre. This elegant hotel is situated in the heart of Wernigerode, in the Harz Mountain region of Saxony-Anhalt, close to the historic town hall. It offers free use of the indoor swimming pool and sauna.